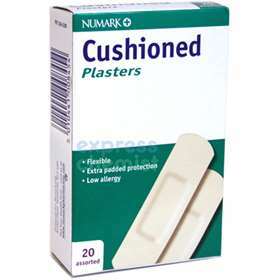 Numark Cushioned Plasters - Individually wrapped plasters for superior hygiene and contamination-free wound protection. Numark cushioned plasters provide extra padded protection to even the most awkward areas, such as fingers, knees and elbows. Highly flexible and with a non-stick pad these plasters absorb any knocks allowing the wound to heal safely. Includes 6 38x72 mm and 14 19x72 mm plasters.